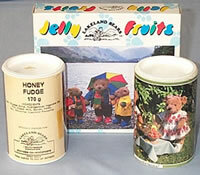 Over the years a number of Lakeland Bear products were produced. 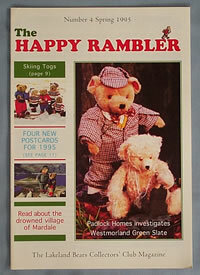 Designs often included the Lakeland Bear logo (shown above) that depicted a hiking bear known affectionately as the Happy Rambler. 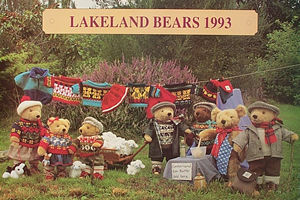 Postcards, greetings cards, bookmarks, wrapping paper, gift tags, guide books, colouring books, mugs, plates, teasets, rubber stamps, car stickers, spoons, thimbles, keyrings, pens, pencils, note books, rucksack and umbrella were all manufactured and many were only available from the Lakeland Bear shops. 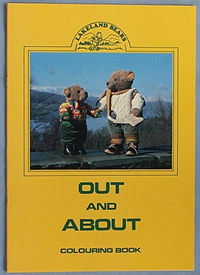 These unique 34 page books contain hundreds of coloured photographs of Lakeland Bears at work, rest and play and they will help you discover just what it is that has made the area so popular with visitors. Discover how people lived in the area and how they earned a living hundreds of years ago. 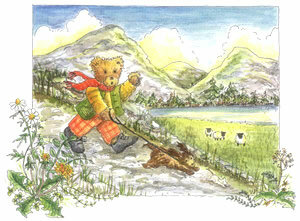 Spend time with Beatrix Potter, Wordsworth and his Lake Poet friends. Go hiking, sailing, fishing, mining, charcoal burning and much more. 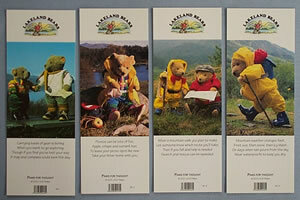 Your guide is Bowden Pike, a knowledgeable Lakeland Bear. Grasmere & Rydal - Rambling around the village of Grasmere and on to Rydal, Bowden Pike discovers much about this popular locality. Troutbeck to Ullswater - Walking from Troutbeck via the Kirkstone Pass to Ullswater Bowden Pike gives us his unique bear's-eye view of the area. 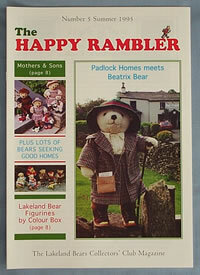 Named 'The Happy Rambler', there are just five Lakeland Bear club magazines which were issued from Spring 1994 to Summer 1995. 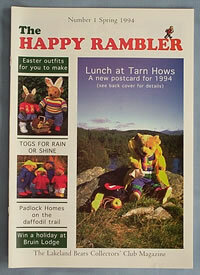 Each magazines contains 12 pages of news and information about the Lake District, items to make for bears, special offers and stories and pictures from other bears around the world. 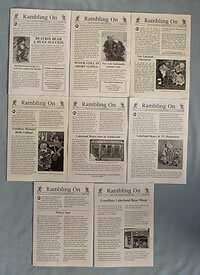 These were followed by smaller black and white (newspaper style) leaflets named 'Rambling On'. There are eight of these in total. 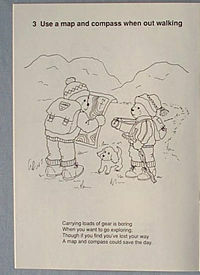 The 12 page 'Out and About' colouring books had a small descriptive verse accompanying each picture. 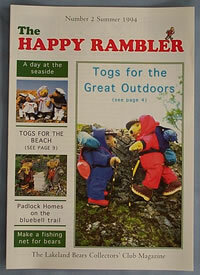 These proved very popular with children as did the mini-poster telling the story of Rowan's Dinosaur. 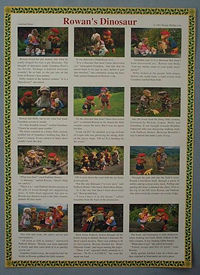 Other mini-posters included one done as a 1993 catalogue showing available bears and clothing and one of brown bears and their colourful caravan. 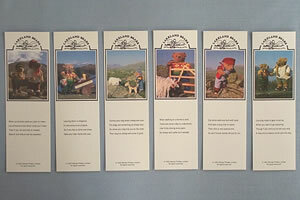 A set of six bookmarks were printed in 1990 and a set of four in 2001. Each picture was accompanied by a descriptive verse. Wrapping paper and gift tags were printed in 2000. 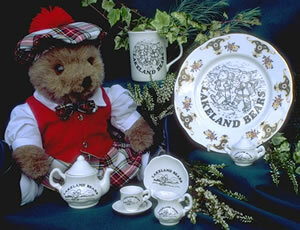 Items bearing the Lakeland Bear logo were very popular. 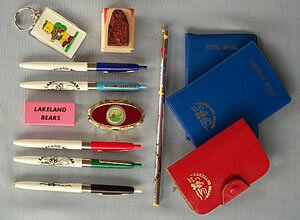 Pens, pencils, rubbers, notebooks, keyrings, spoon, pill box, thimble etc. Just a small selection of those produced over the years is shown here. 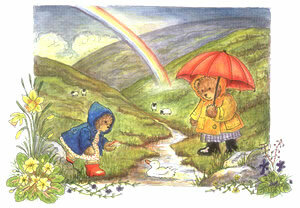 In the 1990s rubber stamps became very popular and Lakeland Bears had two of these designed exclusively for them. 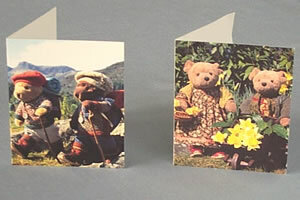 The first depicted the indomitable bear detective Padlock Holmes and the second a hiking bear heavily laden with 'bear essentials'. 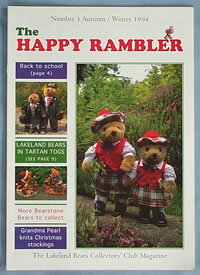 The Happy Rambler as seen on the Lakeland Bear logo could be found on a variety of mugs, plates, toy teasets, fridge magnets and figurines. 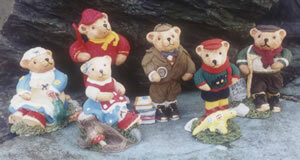 In 1995 Colour Box created figurines of the six bears featured in Wendy's original story 'Rowan's Dinosaur'. 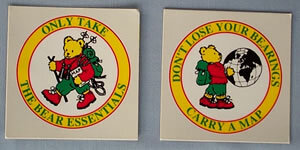 Wendy designed two brightly coloured stickers for car windows 'Only take the bear essentials' and 'Don't lose your bearings, carry a map'. 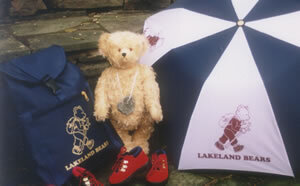 The exclusive limited edition Lakeland Bear umbrella and rucksack displaying the Happy Rambler logo appealed to a select number of Lakeland Bear enthusiasts. The cute fluffy creatures attached to ribbons declaring 'I love Lakeland Bears' were inexpensive and few visitors left the shop without one. 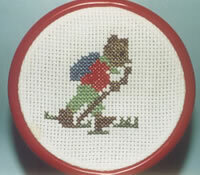 For cross-stitch enthusiats there were tiny embroidery kits depicting the Happy Rambler. 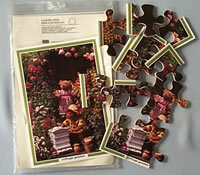 These were made locally as were the wooden jigsaws and mouth-watering sweets and biscuits. 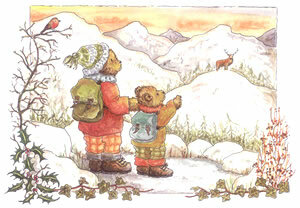 Local artist Elizabeth Stevens used Lakeland Bears for her four seasons pictures. 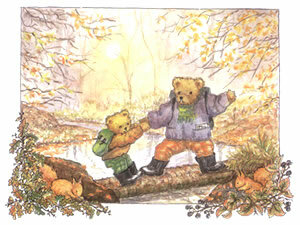 Although the majority of customers purchased a bear wearing outdoor clothing and clogs they would often request other clothes that the bear could wear for special occasions. 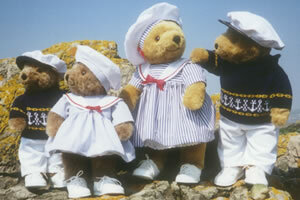 Shown here are the sailor boy and sailor girl outfits and school uniforms (leather satchel made as limited edition). The millennium was celebrated with a special red, white and blue sweater. 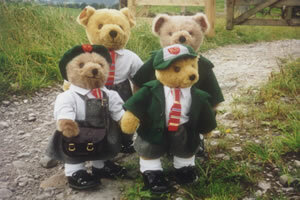 Over the years Lakeland Bears were featured in a number of publications in Britain and overseas. 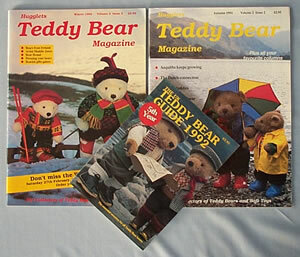 In Autumn 1991 and Winter 1992 they were on the front cover of Hugglets magazine and in 1992 were featured on the cover of Hugglets UK Teddy Bear Guide. 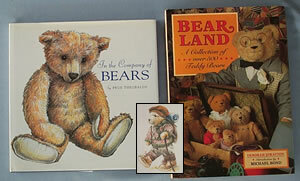 Books published in Holland, Italy, Japan, Australia and America also featured the bears. 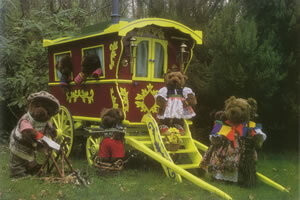 In 2001 Lakeland Bears were honoured to be chosen by well known artist Pru Theobalds to appear in her beatuful book entitled 'In the Company of Bears'.